Fluffy and fun sprinkle pancakes! What a special breakfast treat to surprise someone on their special day! These are completely from scratch, no cake mix with artificial ingredients (exception of sprinkles), and no hydrogenated oils. They are soft melt in your mouth pancakes, with white vanilla frosting syrup that taste like actual birthday cake, and in my opinion even better! 5 tablespoons milk, half/half, or heavy cream. * I also made these with buttermilk and milk, and spelt flour worked well too. 1. In a bowl sift together flour,salt,baking powder, and baking soda. 2. In a separate bowl, whisk eggs with sugar and vanilla. 7. Add oil and melted butter. 9. Set aside for 8-10 minutes. batter will become fluffy. 12. Spray pan with non stck cooking spray. 13. Scoop (I use ice cream scoop) or ladle batter on the heated pan/griddle. 14. Cook the pancake about 1-2 min, or until bubbles form on the pancake. Flip the pancake and cook the other side. 1.Mix softened butter,salt, and powdered sugar. 2. Add milk or half/half and vanilla. stir until smooth. 3. Heat it in microwave for 15 seconds or more for runny consistency. * you can add more milk or cream for more runny syrup. Enjoy! Please don’t forget share, comment, and tag! 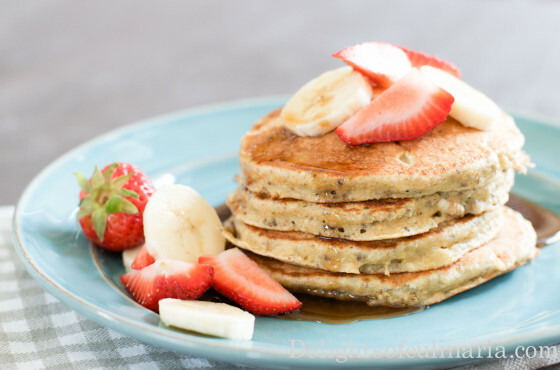 These healthy wholesome banana pancakes are a twist on traditional pancakes.They are moist and fluffy with a slight nutty taste and loaded with super-foods. Spelt/whole wheat flour,chia seeds, and flax seed meal has tons and tons of health benefits.I use chia seeds and flax meal a lot .I add them to cereal,yoghurt,oatmeal,porridge,muffins,pancakes,waffles…etz. You can call this totally guilt-less delightful breakfast that can give you a good health boost. 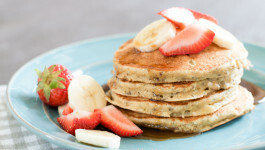 Variations: You can use 1 cup flour and 1/2 cup oat bran if desired.If you try to avoid sugar,you can avoid adding it,or replace with honey or any other healthy sweetner.You can use regular granulated or brown sugar too.You can replace regular dairy milk with almond,coconut, or soy milk. In a mixing bowl combine flour,chia seeds,flax meal,baking powder,salt, and walnuts (if desired). Using a hand mixer,beat eggs,sugar and bananas.Gradually add milk. Add flour and other mixed ingredients to wet ingredients.Mix until well combined and all lumps disappeared. Heat a lightly oiled skillet or griddle on med-low heat.Add one scoop of batter using a ice cream scooper. Allow pancakes to cook until they are golden brown.Flip pancakes over and cook the other side until golden brown . 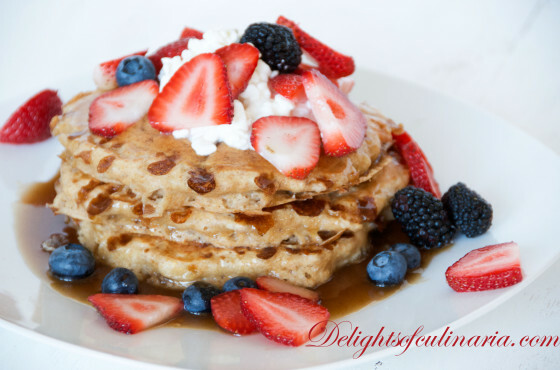 Serve with pure maple syrup(healthier choice) or homemade syrup. Top with fresh fruits,berries,whipped cream or cottage cheese mixed with condensed milk. 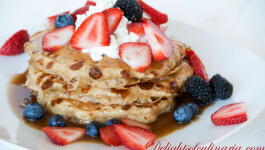 Want try something different then regular pancakes? These pancakes are fluffy,wholesome,and delicious.Adding cottage cheese just makes them delicate and somewhat hearty.You can top it off with any type of fruit you like; berries,bananas,kiwi,peaches or anything you like.You can choose from 2 homemade syrups or just use real maple syrup. In a mixing bowl combine all dry ingredients. In another mixing bowl whisk eggs with sugar,vanilla,oil,and cottage cheese. Gradually add in all dry ingredients. Heat a skillet or griddle on medium-low heat. Add a spoonful or scoop of batter to a skillet. Flip pancake and repeat the process with the rest of the batter. Combine condensed milk with heavy whipping cream in a small saucepan. Heat the saucepan on med-low heat. Combine water and brown sugar in a medium saucepan. Bring it to a boil on a high heat. Boil for 8-10 minutes until the syrup reduces to approximately 1 cup. Remove from heat and whisk in the cream and cinnamon if you like. We like to combine these two syrups together.It's really good! 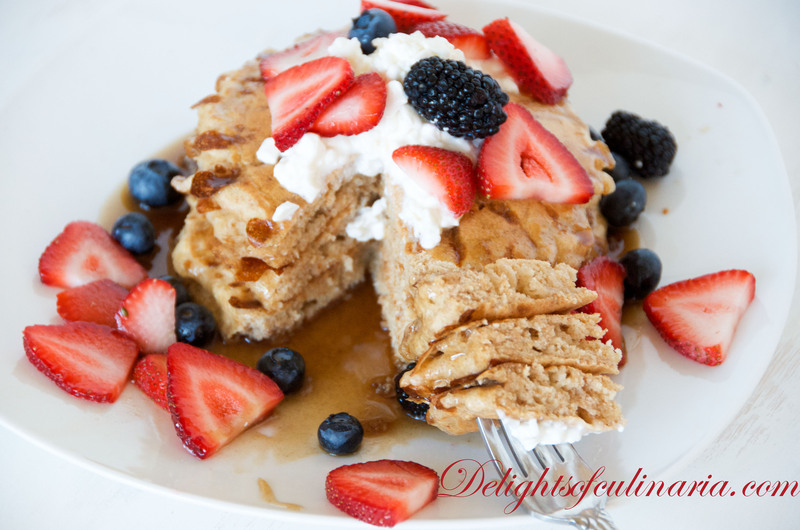 Pour syrup over pancakes.Add dallop of cottage cheese and top it off with fruits or berries.